The Nutcracker is a magical holiday story. My sister and I normally go see the ballet each year. This year I decided to bring my daughter for the first time. I was so excited for her to see a real ballet. She enjoyed it but she leaned over to me in the middle of it and asked "Why aren't they talking?" I didn't think to explain that in advance. She has attended several theatre shows lately and was expecting the performers to sing and talk. Once I explained that the dancers and music ARE the show she seemed to enjoy it more. 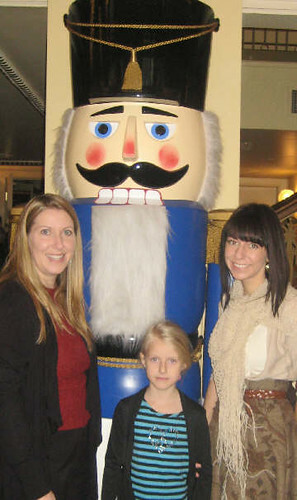 We attended the Nutcracker by Ballet West of Salt Lake City. It was a magnificent production. I love doing activities that bring characters to life to encourage reading. Here are some books you might like to add to your Christmas collection. The Nutcracker Ballet by Mara Conlon is a play set that the stage pops out and it has paper dolls you can move around as you tell the story. Make your own Nutcracker out of a Pringles can. See Kaboose for more details. The Sweet Adventures of SugarBelle has a great tutorial to make Nutcracker Cookie Ornaments. Or an amazing gingerbread creation of a scene from the Nutcracker can be found at Cake Power Kids.